As tough as it may be to wave goodbye to rosé season, there's something new -- and potentially better -- to look forward to as the crisp fall air ushers in cravings for red wine. 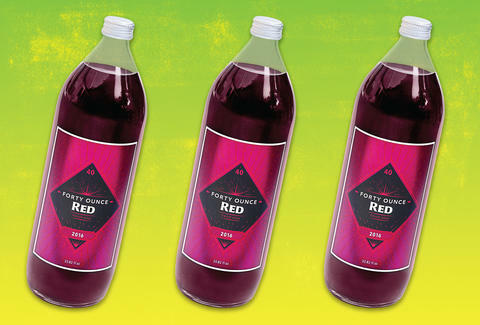 That's because the team behind Forty Ounce Rosé just unleashed a new Forty Ounce Red, which contains 1.5 times as much wine as a traditional 750ml bottle and costs only $16. As always, brown bagging it is optional. Much like the rosé it introduced earlier this year, this new red varietal is a far cry from the bottom-shelf hooch you might be accustomed to sipping from 40s. As its maker and co-founder of Forty Ounce Wines describes, it's a "light-bodied, lively, and dry" red, and is best served with a slight chill, or no warmer than room temp. It's made from sustainably grown Gamay grapes from Northern France, and won't "knock you out with tannins," so you can drink it all day/night (in moderation, people) without worrying about a headachy hangover. Forty Ounce Red is scheduled to hit shelves September 15, so keep an eye out for the bottles at your local liquor store. Looks like the PSL has some new competition in the fall beverage arena.